Iowa’s newest, and largest, privately owned solar array will track the sun as it moves in the sky. Iowa’s newest, and largest, privately owned solar array will track the sun as it moves in the sky. It will provide power and charge a giant battery to provide its owner more affordable electricity when prices are highest. It’s called a solar plus storage system, and it’s the first large scale installation in Iowa. The Iowa Economic Development Authority (IEDA) is sponsoring a study to encourage the spread of this new renewable technology throughout the state. 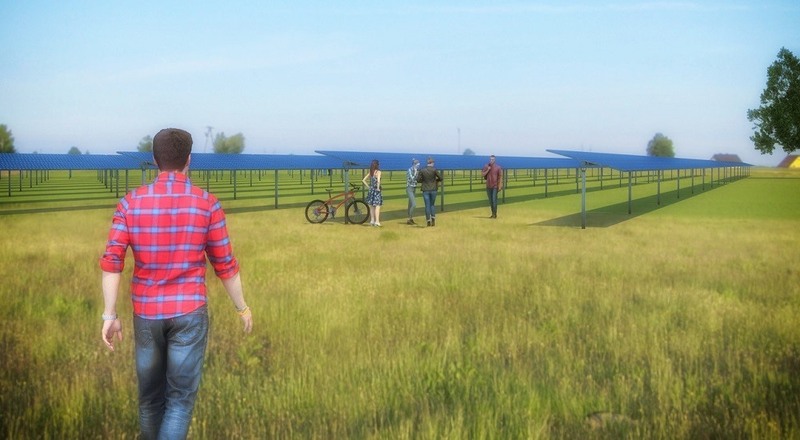 The Maharishi University of Management in Fairfield, Iowa, is constructing the 1.1-megawatt solar tracking array on five acres of land. The panels in the array will move 120 degrees to track the sun’s movement. Each row of panels can move independently to ensure the optimal angle. The array will provide electricity to the university and charge a large vanadium flow battery. Then, when electricity is in highest demand and prices peak, (like on hot, summer days) the university can draw from its own battery supply. Over time, reducing these “demand charges” will help the university reduce its electricity bill. The battery power can also be used during emergency outages. Results of the research garnered from the study will provide technical information to guide future projects under consideration throughout the state and identify information gaps about technology options, costs, safety and benefits of storage. It will also shape workforce development strategies to ensure the emerging industry has an adequately trained supply of tradespeople. Once prohibitively expensive for most consumers, batteries like the one in this project have decreased drastically in price. The cost of battery storage decreased 24 percent between 2015 and 2016, and the trend is predicted to continue. As renewable sources of electricity account for a greater share of our state’s power generation, battery storage is likely to be an important part of Iowa’s future electricity mix. Already, almost 40 percent of Iowa’s electricity comes from wind, and more solar projects are also coming online. When the wind is not blowing or the sun is not shining, battery storage can continue to supply the grid with power. This IEDA-sponsored research will provide Iowa’s utilities, state agencies and renewable energy organizations valuable information to better understand the role of battery storage in Iowa’s energy market. IEDA is convening a storage committee to address this topic, which was identified as an important next step in the Iowa Energy Plan.